You must be logged in to request organization status. To add your event, you must follow a simple process of first adding a venue (place), getting it approved, then adding your event to your venue. Your venue and event must be accessible to the general public. It must happen at a specific date with a starting time and an ending time each day. Key: Green text means you've already completed that step. Are you an organization that holds events at multiple locations? Fill out this form to become an organization! You'll need to create an account with CityOf.com Events in order to begin the process. Please click here to register. A valid email is required. You only need to enter a brand new venue if your venue is not on our website already. You won't be able to enter an already existing venue, so you'll need to "claim" an existing venue. Both methods will need to be looked over by our staff, and we may need to call you and confirm so please be sure to provide a valid phone number. Once your venue ownership is confirmed you will be able to add events to your venue. If the venue you want to add can be found with search, visit the venue's page while logged in and you will see a red button with the label "Request To Add Events To This Venue". Click the button, then fill out the form. You must be logged into your account. 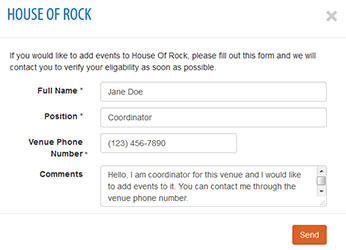 Fill out the form so that someone can contact you and confirm ownership of your venue. If your venue is not on our site you are free to add it. After your new event is approved you will be able to post events to it. Fill out the form here. Tip: You can check the status of your venue's approval here. Your venue ownership or new venue must be verified by our staff. If you have any questions or comments please call us at (888) 785-0500 Monday-Friday 8:00am - 5:00pm CST and mention CityOf.com Events. Once you get an email stating that your venue is approved, you are free to add events to them. Please visit your "Manage Events" page. You can find this link at the very top of any page, or you can click here. On the venue page, you can click "Add Events" to begin the addition of your new event. Note that all events will be proofed before going live. You will be notified as soon as you event becomes live. Don't include the venue name in the event name, the venue will always be displayed next to the event. Be sure to include an admission price if there is one. Descriptions help your event be found by searches, so be sure to fill it out. Times are by each day when your event is going to happen. Jane Doe will talk at our venue on 4/17/2015, 4/18/2015, and 4/19/2015 at 6:00pm - 8:00pm all three days. You will choose the first day it is happening on the calendar, so 4/17/2015. Since the event is only 3 days, we select "A Few Days Only" in the drop down. You can choose monthly, every week, or yearly if you need that flexibility as well. Since our event is happening for 3 days, you will choose "3" in the box "How Many Times To Occur"
Once all requirements are met, you will see a written out description of your selection in the blue box, read it and confirm it sounds correct and hit "Submit"
If you made a mistake, you can cancel an event at the bottom and re-enter it correctly. Uncheck the "Active" button. If your event spans through midnight of one day to the am hours of another, create two slots. Example: 4/17/2015 8:00pm - 11:30pm and 4/18/2015 12:00am - 3:00am.